Rose isn't like the other orphans at St Bridget's Home for Abandoned Girls. Instead of dreaming of getting adopted by loving, wealthy parents, Rose wants to get a job and be independent. She doesn't need anyone but herself. She finds her escape working as a maid for Mr. Fountain, an alchemist. 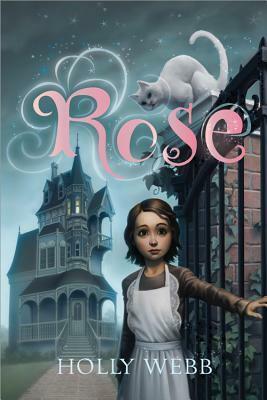 Unable to ignore the magic that flows throughout the grand residence, Rose realizes that just maybe; she might have a little bit of magic in her too. This new series featuring magicians, witches, talking cats, mist-monsters, and friendships will have young readers in a trance. "What are you doing in my room?" Rose hissed angrily. The attribution hissed already demonstrates anger. There is zero need for the adverb angrily to be in that sentence. Rose peered out the corner of the window at the street below, watching interestedly as two little girls walked past with their nursemaid. And that was the first sentence. It was at that moment I knew I probably wouldn't be finishing this novel. I mean, yes, interestedly is a word, but it completely halts the flow, something I think a writer would want to get right on her very first sentence of the book. And as I mentioned above, even my former sixth graders would have looked at that first sentence in a rough draft and said, "That just doesn't flow right. I think I need to reword this." So after reading a little over 100 pages of nonstop adverbs, I decided I just couldn't take it anymore. My frustration and snarkiness was clouding my ability to even follow the plot. But if you're someone who doesn't get bogged down by a writer's craft choices, I imagine that this is a lovely little story; I just couldn't find it because I was too busy hunting for adverbs and trying to come up with ways the author could have reworded the sentence to make it stronger. Now some may read this review and say, "Who does she think she is? Her writing isn't exactly Pulitzer Prize worthy." And you're absolutely right. It's not. But as an educated reader, I know a thing or two about published writing, and to me, an editor should have picked up on those excessive adverbs and asked the author to revise for better flow. When I read a published work of fiction, whether it's for adults or children, I want it to read like a published work of fiction instead of something a fourth grader might have written.